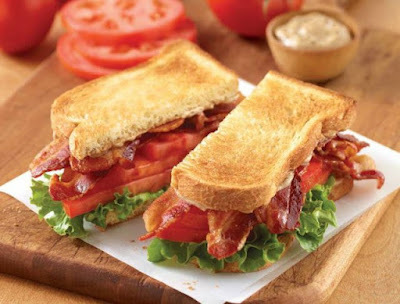 Corner Bakery Brings Back BBLT and Other "Fan Favorites"
Corner Bakery Cafe returns the seasonal BBLT Sandwich early this year along with a number of "fan-favorite" menu items. - BBLT Sandwich - Six thick slices of applewood smoked bacon, tomatoes, leaf lettuce, and cracked pepper balsamic mayo on Mom’s white toast. - Tomato Mozzarella Sandwich - Fresh mozzarella, tomatoes, roasted red peppers, arugula, and basil drizzled with balsamic vinaigrette on ciabatta ficelle. - Roast Beef & Cheddar Sandwich - Roast beef, cheddar cheese, lettuce, tomatoes, and cracked pepper balsamic mayo on sesame bread. - Asian Wonton Salad - All-natural chicken, edamame, cucumbers, red bell peppers, carrots, green onions, cilantro, and crispy wontons with mixed greens, cabbage, and Asian dressing. - Santa Fe Ranch Salad - All-natural chicken, fresh corn salsa, diced tomatoes, cheddar cheese, tortilla strips, and avocado ranch dressing on a bed of iceberg and romaine lettuce. Photo via Corner Bakery Cafe.